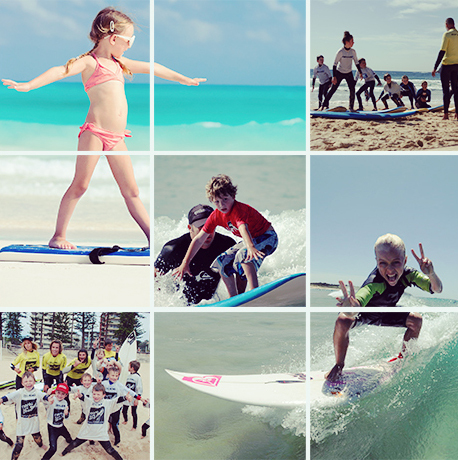 We will be running 4 and 8 week afterschool programs for the Learn to Surf, Intermediate and Elite Programs. Alternatively, check out the skate & gym sessions at the our NEW High Performance Surf Centre! Don’t forget to wear comfortable gym clothes and shoes for the gym circuits and half pipe skate sessions. Beginners are welcome. Both the gym and beach sessions for the Elite programs will run for the full 8 weeks this term. Programs start in the second week of term at all locations. If there is a cancellation of a lesson due to conditions being unsuitable, a make-up lesson will be scheduled in the final week of the term. All beach lessons start at 16:00 and finish at 17:30. Gym sessions start at 16:15 and finish at 17:15. 4 week Learn to Surf Program starting in April. Cost is $160pp for a 4 week program. Wetsuits, boards and rash vests provided. Instructors are in the water. 4 week Intermediate Program starting in April. 8 week Elite Program starting in April. Cost is $280pp for a 8 week program. Afterschool Gym and skate sessions start in the 1st week of the term. The lesson is a circuit with body-weight exercises designed to increase core strength and balance needed for surfing. The final half hour is spent on the skate ramp practicing drop-ins, turns, etc. The cost for an 10 week term is $200pp for one session per week or $20 per week for a casual session. High Performance Surf Centre in Cromer Unit 8 Villers Place, Cromer 2099. *COMBINED Gym and Beach Packages are available at $400pp per term. Please call 9932 7000 to book. PLEASE NOTE: Make- up classes can be taken on other days within the same term only. Make-up classes are non-transferrable for other Manly Surf School programs..